Why are we concerned about birds in sagebrush habitats? Nationally, grassland and shrubland birds show the most consistent population declines over the last 30 years of any group of bird species. Across the U.S., the populations of 63% of shrubland and shrub dependent bird species and 70% of grassland species are declining. In the Intermountain West, more than 50% of grassland and shrubland species show downward trends (Sauer et al. 1996). 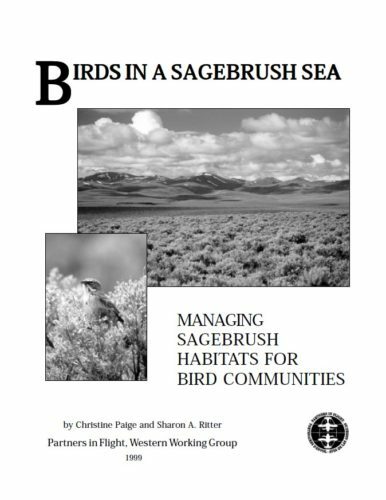 A recent broad-scale assessment of the Columbia River Basin identified sagebrush steppe as the highest priority habitat for conservation based on trends in bird populations and habitat (Saab and Rich 1997). Although the variety of bird species found in sagebrush habitats is far less than in a lush forest, many sagebrush birds, such as sage grouse, live nowhere else. The birds in these shrublands not only add to the West’s diversity of wildlife, they are important to the sagebrush ecosystem itself, providing crucial services such as dispersing seeds and preying on insects and rodents. Other wildlife species, including pronghorn, sagebrush lizard, sagebrush vole, and pygmy rabbit, also depend on healthy sagebrush habitat.